Old Timer Knives are genuine classics made today by Taylor LLC. Featuring saw-cut Delrin handles, brass liners, nickel silver bolsters, and stainless steel blades these are the knives that you remember from bygone times. 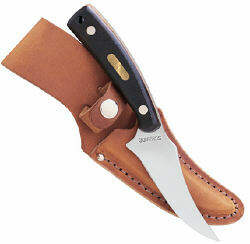 The Old Timer Sharpfinger 152OT features an upswept fixed blade design. This is THE best wild game skinner I remember owning. The first one I had as a teenager when my dad and I would go hunting. I remember the old ads for these knives, they said "For small elephants and large squirrels" That about sums up what all you can do with this knife.